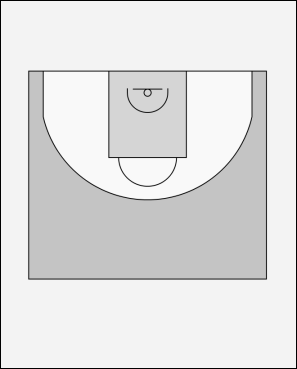 Player 1 must dribble around the cone at halfway and then drive to the basket. Player 2 runs around the cone at halfway and then aims to get ahead of player 1 to give a passing option. X must run around the cone and then guard 2 v 1. They should hedge and try and confuse the offence. You can do this drill at both ends of the floor having both groups run around the same cones so that the players have to get through "traffic" at half way.